South Africa's Market Theatre's recent acclaimed revival of Athol Fugard's (written in collaboration with John Kani and Winston Ntshona) Sizwe Banzi is Dead has been brought to the McCarter Theatre in a co-production with Syracuse Stage. What a gift and what a treat it will be for audiences at both theaters. Kani, who shared the 1972 -73 Best Actor Tony Award with Ntshona, is the director of this newly envisioned production that now stars Kani's talented son Atandwa Kani in the two roles he recently played at the Market Theater. 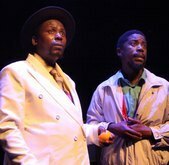 The title role is also played by its terrific Market Theater interpreter Mncedisi Shabangu. Consider the daring of how the celebrated and prolific white South African playwright Fugard along with collaborating black actors Kani and Ntshona to have created this play that when segregation was still in force exposed the inane bureaucracy and restrictions that kept blacks from traveling and from finding employment. That they were imprisoned for performing their roles is a chilling bit of history. Forty years later, we can still respond to the plentiful humor as well as the amount of pathos and poignancy integrated into this cleverly politicized ninety-minute comedy. The plot, as deployed by its three beautifully imagined characters, reveals a distinctly comedic disrespect for the authoritarian restrictions of the time. After a minor skirmish with the police, Sizwe Banzi (Mncedisi Shabangu) is told he may no longer stay or seek employment in Port Elizabeth but must return to his home in King William's Town. A plan is hatched to help the desperate and distraught Banzi by Styles (Atandwa Kani), a photographer with whom he strikes up an acquaintance, and his friend Buntu (also played by Kani) who is harboring Banzi. After a night of heavy drinking, Banzi and Buntu come upon a dead body in an alley with proper passbook, identification and employment papers. Have they found a way to beat the system?